I’ve been working my way through Elizabeth Taylor’s stories, slowly but surely over the last couple of years. Originally published in 1965, A Dedicated Man was her third collection of short fiction, and I think it’s my favourite of the three I’ve read so far. (You can read my posts about the first two here: Hester Lilly and The Blush.). As ever, Taylor demonstrates her skill in capturing people in their most private of moments. In short, we see individuals facing up to dashed dreams, social embarrassment and the realities of their marginalised lives. As with other collections I’ve reviewed, I’m not going try to cover every story; instead, I’ll try to focus on a few favourites to give you a flavour of the volume as a whole. The collection opens with Girl Reading, a poignant story of inadequacies and social embarrassment. Etta Salkeld, a young girl from a relatively poor background, enjoys staying with her well-to-do schoolfriend, Sarah Lippmann, during the holidays. The Lippmanns are a sociable, sophisticated bunch, their home full of activity with guests dropping in and out at various times of the day. Etta feels at home there, particularly as she longs to be part of a lively, comfortable family – one where she can observe other individuals at first hand, not just in books. Mrs Salkeld would like her daughter to invite Sarah to their house to return the Lippmans’ hospitality, but Etta is embarrassed by the shabbiness of the place and fears her friend would be bored – points that hit home to Mrs Salkeld when she finally gets to meet Mrs Lippmann in her rather grand surroundings. The contrast between the two women is very striking. The Thames Spread Out features Rose, a middle-aged woman who lives on her own in a house by the river. Every Friday, Rose receives a visit from her married lover, Gilbert, who stops off to see her on his way home to his wife. For the rest of the week, Rose must survive largely on the money that Gilbert leaves when he departs on Saturday mornings, treating herself to a few peppermint creams and other little indulgences when she can. This Friday everything is different; the river has flooded, and the roads are impassable, leaving Rose trapped in the upstairs of her house, somewhat at the mercy of a couple of unfamiliar men who are staying next door. It is only once the water starts to recede that Rose realises the true emptiness of her life, especially when she compares it to that of her sister. This is a quietly devasting story, the type of piece that Elizabeth Taylor does so well – and yet there is a glimmer of hope at the end as Rose finally takes control of her life. In A Dedicated Man, a pompous waiter, Silcox, and his dull but dependable colleague, Edith, have taken the opportunity to move positions from a shabby seaside B&B to a more refined hotel in the Home Counties. The need to masquerade as husband and wife seems a small sacrifice to make, particularly for the improvement in the pair’s standing. After a somewhat awkward period of adjustment to sharing a twin-bedded room, Silcox and Edith begin to settle into a rhythm, buoyed by their ambitions and desires to succeed. However, when Silcox invents a son to give the couple a more rounded family background, the tissue of lies begins to unravel, ultimately exposing him to ridicule and scandal. This is a powerful piece, a fitting lead story for the collection as a whole. Holidays feature in several pieces in this collection, perhaps most notably In a Different Light. In this story, Barbara is visiting Jane, her recently widowed sister at her home in Greece. While there, Barbara forms an unlikely friendship with Roland, a young man holidaying on his own, his wife preferring to stay with her sister in Buxton. The relationship is all very chaste as Barbara and Roland settle into a rhythm of walks in the countryside and siestas in the afternoon. Before leaving the island, the pair exchange addresses, never thinking that they will actually meet up again; but in her restlessness back home, Barbara decides to invite Roland and his wife, Iris, for Sunday lunch, just to recapture something of the visit. When Iris arrives, she reveals herself to be loud and pushy, so much so that Barbara’s young children take an instant dislike to her. Roland, for his part, is a different person altogether, more formal and serious than he seemed in Greece. As Barbara reflects on the situation, she realises the true nature of Roland’s life with Iris, the stripping away of his verve and vitality. In The Voices, Laura, a young woman recovering from an illness, is holidaying at a hotel in Athens; but instead of going on excursions to see the sights herself, Laura spends much of her time listening to the two women in the adjacent room as they discuss their own trips to various places of interest. In effect, Laura is living her holiday through the activities of these women, imagining how they look as they go about their days. This is another beautifully observed story with a glimmer of brightness at the end. In the Sun also features individuals abroad, this time three English couples holidaying at the same characterless hotel in Morocco. This a story of petty snobberies and prejudices as the couples observe and gossip about one another – especially the Wallaces, the last of the three pairs to arrive. It’s also the most amusing piece in the collection, laced as it is with Taylor’s fabulously sharp wit. As the story draws to a close, there is a surprise revelation, one that leads the others to view the Wallaces in a somewhat different light, in spite of the fault lines in their unlikely marriage. All in all, this is a superb collection of stories from Elizabeth Taylor. She portrays her characters in a way that conveys an acute understanding of their immediate situation – their hopes and dreams, their day-to-day preoccupations and concerns, their petty foibles and failings. 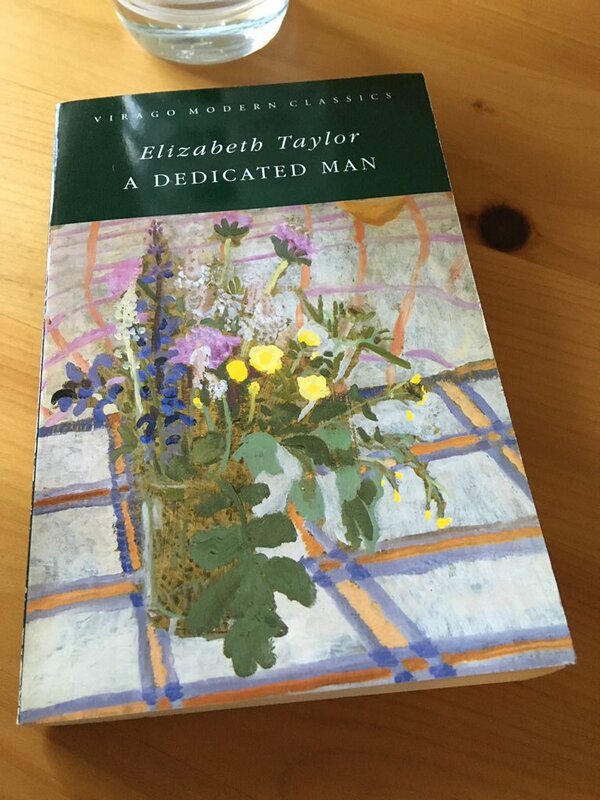 A Dedicated Man is published by Virago; personal copy. This entry was posted in Book Reviews, Taylor Elizabeth and tagged #ReadWomen, Book Review, Elizabeth Taylor, Fiction, Short Stories, UK, Virago on March 5, 2019 by JacquiWine. Do you have a favourite, Simon? I loved the Letter-Writers, too. It’s the type of story Elizabeth Taylor does so well, desperately sad with a glimmer of hope at the end. I couldn’t hep thinking about in during the Thames story here. Oh, and thanks for the link to your piece – I’ll definitely take a look. Perfect sqewering of petty snobbery in that final quote. This is very tempting Jacqui! I definitely must read more of Elizabeth Taylor. I have her collection of stories in the NYRB Classics edition, which I hope to get to soon. But right now, her novels are calling to me first – particularly A View of the Harbour and Mrs Palfrey at the Claremont. You have such treats to look forward to there, particularly with Mrs Palfrey – such a beautiful, bittersweet novel, executed to perfection. Enjoy. I have written this before, but I really must read Elszabeth Taynor. Based upon your reviews and reviews that I have seen elsewhere, I think that her works would be right up my ally. I likly would start with one of her novels. I agree that the way to handle short story collections is to just concentrate on a little limited Number of stories. That is the way that I usually blog about short stories. I think you’d really her style, Brian. Her prose is flawless, not a word out of place, and the scenarios she creates are so beautifully observed. Mrs Palfrey at the Claremont would be a good one to try, or possibly her debut novel, At Mrs Lippincote’s, which came out in the mid ’40s. Whichever you choose, it’s hard to go wrong with her – she’s so good. Brilliant review, of what really is a superb collection. Taylor’s short story writing is so assured she can surprise us one minute and make us smile the next, all while maintaining her wonderful observational eye. She knows people so well. Thanks, Ali. Taylor reminds me a little of Penelope Fitzgerald in that respect as she can blend sly humour with touches of poignancy to very great effect. As you say, the writing is so economical and assured, every observation or scene is there for a reason. I haven’t read any of Taylor’s short stories – I was planning on getting through her novels first. But you have reminded me I haven’t read her in a while. I like the way you have read each volume of her stories rather than just ploughing through the Collected Stories. Yes, I’d much rather read the individual collections as long as they’re readily available to by at reasonable prices. Luckily I’ve been able to pick up a few old green Virago editions of her stories over the years, mostly at one of the local charity shops (someone must have been having a major clearout). Just The Devastating Boys to go now, which many readers consider to be the best of the lot. Mind you, I still need to read four or five of her novels, so there’s still plenty of Taylor to look forward to! Yes, that’s definitely her area of skill. As Ali was saying above, she knows people so well. This sounds completely brilliant. I’m sure I’ve said this before, but having only read her novels I really must get to Taylor’s short stories. You’re so right that quietly devastating is what she does so well. Her stories are great, well worth reading – even her early pieces are brilliantly observed (the titular story in Hester Lilly is worth the entry price alone). The ‘quietly devastating’ quality really comes through in the Thames flood story as the tragedy of Rose’s situation is almost too much to bear – at least until the note of optimism or renewal is revealed towards the end. That’s where I started with Taylor, and I haven’t looked back since! If you’re casting around for ideas on where to go next with her, may I suggest A View of the Harbour, a wonderful ensemble piece set in the kind of town where everyone knows everyone else’s business? Or you could try her debut novel, At Mrs Lippincote’s, another favourite. Excellent review Jacqui. I am more familiar with Elizabeth Taylor’s novels, but these short stories sound very inviting. It sounds excellent. No surprise. The Thames Spread Out sounds very intriguing. She does like a hotel setting. I think they should all be in my collected stories book. You’re right, she does like a hotel setting! I guess it’s a great environment for bringing various characters together, often those from different backgrounds who might not normally mix with one another – always an interesting premise for fiction. I’ve been toying with the idea of working steadily through Elizabeth Taylor’s stories when I finish reading through Mavis Gallant’s collections. Other than one novel, Taylor’s stories are all I have left to read of her, freshly I mean. I’m sure I will be every bit as impressed as you! That sounds like a splendid idea! I’m really enjoying working my way through Taylor’s stories, following her development with each collection. (A Dedicated Man feels tighter, more consistent than her first two, although my favourite story so far — The Letter-Writers — came from her second collection, The Blush.) Just one more volume to go now, The Devastating Boys, which may well turn out to be the best of the lot. Oh, I absolutely adore Mrs Palfrey! It’s probably one of my all-time favourite novels, certainly one of the very best books I’ve read in the last five years. I really hope you enjoy it too. Do let me know how you get on with it, Claire – I’d be very interested to know.